I love making this dish, it’s an iconic dish full of warm love and affection, and as I always say: "The way to a man's heart is through his stomach." Heat a 15cm/6in crêpe pan. Measure 2 1⁄2 tbsp. of the batter into a jug, then pour into the pan, moving it around so the mixture swirls and fits the bottom of the pan. When the crêpe is golden underneath (in about 15 seconds if pan is the right temperature), turn and cook for a further 30 seconds, until spotted brown. For the sauce, heat the butter and sugar in a deep frying pan (about 25cm/10in) over a low heat, stirring occasionally, until the sugar begins to dissolve; add the vanilla extract, turn up the heat and allow it to bubble quite fast, until the mixture just starts to go brown and caramelize (about 4 minutes), stirring only towards the end. Add the orange zest, pour in the orange juice (see left); letting the mixture bubble for 3-4 minutes to thicken slightly. 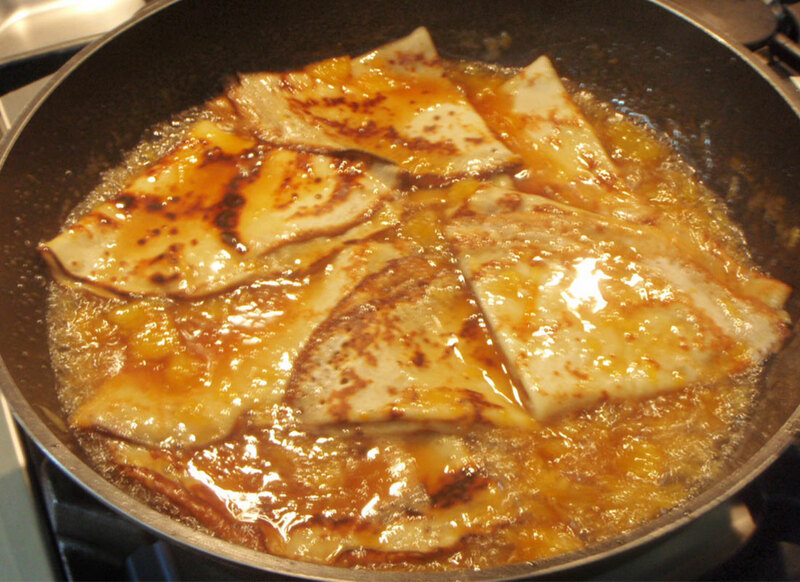 Fold the crêpe into the sauce, and holding it with a fork, coat it well in the mixture. Fold it into quarters and push to one side of the pan. Continue the coating and folding with the remaining crepes. Leave for 2-3 minutes on a low heat, pour the Grand Marnier and cognac on top of the crepes and "flambé" ( light the crepes with a match ) – try to do it in front of your guest because it’s a beautiful fire show to see. And last but certainly not least, enjoy your amazing crêpes with those that you love!